Unique Lives and Experiences is North America’s foremost women’s lecture series developed in response for women’s requests for meaningful dialogue and stimulating interaction. 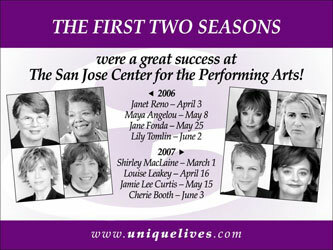 This year will celebrate 16 years of this lecture series and the third season for San Jose. 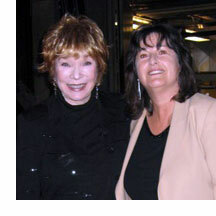 Chris Di Salvo (shown right, with Shirley MacLaine), Professional Effects, Associate Producer, San Jose is responsible for the overall coordination of Unique Lives and Experiences. While the speakers visit San Jose, She is responsible for all celebrity arrangements. She procures sponsorships, arranges transportation, and coordinates interviews with local media. She is responsible for signage, set design and more.